The City of Iron: Wormskin Issue Six: Coming Soon! Wormskin Issue Six: Coming Soon! 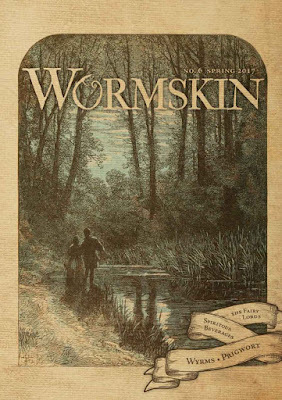 The sixth issue of the Dolmenwood zine, Wormskin, should be out in the next couple of weeks. At 75 pages, it's by far the biggest issue yet! The Fairy Lords of Dolmenwood, by Gavin Norman with hints of Gorgonmilk. Discusses sixteen fairy lords who have some interest in Dolmenwood. The Brackenwold Calendar, by Gavin Norman. The accompanying article to the free Dolmenwood calendar PDF. Prigwort and Surrounds, by Gavin Norman. Descriptions and points of interest in seven hexes around the town of Prigwort. The Baker’s Dozen, by Gavin Norman. A little adventure scenario involving an enchanted bakery. The Gingerbread Grimoire, by Gavin Norman. Four yeasty, gingerbready spells of enchantment. People and Places of Prigwort, by Gavin Norman and Andrew Walter. Inns, taverns, brewmasters, wizards, and high-class tailors -- all can be found in the town of Prigwort! Spirituous Beverages, by Gavin Norman. A little generator, in the fine Dolmenwood tradition, for the fine, spirituous produce of Prigwort. Monsters of the Wood, by Gavin Norman. A Dolmenwood take on the kelpie of folklore (ignoring the AD&D version of the monster) and four local species of dragon (the black bile wyrm, phlegm wyrm, blood wyrm, and yellow bile wyrm). Featuring illustrations by: Andrew Walter, Thomas Novosel, Sean Poppe, Kelvin Green, Rory Walker, Paul Gallagher.